Meta-analyses are increasingly used for synthesis of evidence from biomedical research, and often include an assessment of publication bias based on visual or analytical detection of asymmetry in funnel plots. We studied the influence of different normalisation approaches, sample size and intervention effects on funnel plot asymmetry, using empirical datasets and illustrative simulations. We found that funnel plots of the Standardized Mean Difference (SMD) plotted against the standard error (SE) are susceptible to distortion, leading to overestimation of the existence and extent of publication bias. Distortion was more severe when the primary studies had a small sample size and when an intervention effect was present. We show that using the Normalised Mean Difference measure as effect size (when possible), or plotting the SMD against a sample size-based precision estimate, are more reliable alternatives. We conclude that funnel plots using the SMD in combination with the SE are unsuitable for publication bias assessments and can lead to false-positive results. Systematic reviews are literature reviews intended to answer a particular research question by identifying, appraising and synthesizing all research evidence relevant to that question. They may include a meta-analysis, a statistical approach in which outcome data from individual studies are combined, which can be used to estimate the direction and magnitude of any underlying intervention effect, and to explore sources of between-study heterogeneity. Simultaneously, meta-analysis can be used to assess the risk of publication bias: the phenomenon that published research is more likely to have positive or statistically significant results than unpublished experiments (Dwan et al., 2013). Meta-analyses are routinely used in clinical research to guide clinical practice and healthcare policy, reduce research waste and increase patient safety (Chalmers et al., 2014). The use of meta-analysis continues to increase (Bastian et al., 2010) and it has become more common to apply these approaches to the synthesis of preclinical evidence (Korevaar et al., 2011). Importantly, preclinical studies are, generally, individually small, with large numbers of studies included in meta-analysis, and large observed effects of interventions. This contrasts with clinical research, where meta-analyses usually involve a smaller number of individually larger experiments with smaller intervention effects. This calls for methodological research to ascertain whether approaches to data analysis routinely used in the clinical domain are appropriate in the pre-clinical domain and for resources that guide and inform researchers, reviewers and readers on best practice. In this light, we present findings which show that the use of the standardized mean difference (SMD) measure of effect size in funnel plots can introduce a risk of incorrect assessment of publication bias, particularly in meta-analyses of preclinical data characterised by a large number of individually small studies with large observed effects. To combine data statistically on e.g. the effects of an intervention which has been tested in several studies, outcome measures first need to be expressed on a common scale. Such scales include (for binary outcomes) the risk or odds ratios; and for continuous data a raw mean difference (RMD), SMD or normalized mean difference (NMD). (1) RMD= Mint − Mctrl. where n is the sample size per group. Thus, the SMD expresses the intervention effect in all studies in the same new unit: the SD. Of note, Equations 3 and 5 estimate the SMD using the approach of Cohen (Cohen, 1988); this estimate is therefore termed Cohen’s d. However, Cohen’s d tends to overestimate the ‘true’ SMD and its variance when the sample sizes in the primary studies are small (e.g. <10). This bias can be corrected using the approach of Hedges (Hedges, 1981), which adjusts both the SMD estimate and its variance by a correction factor based on the total sample size. The resulting estimate is the unbiased SMD known as Hedges’ g (see Supplementary file 2 for full equations). In many clinical meta-analyses, Hedges’ g will be almost identical to Cohen’s d, but the difference between the estimates can be larger in preclinical meta-analyses, where small sample sizes are more common. (see Supplementary file 2 for additional equations and (Vesterinen et al., 2014) for a comprehensive overview of (preclinical) meta-analysis methodology). Note that Equation 5 dictates that the SESMD is correlated to the SMD effect size, whereas the SEs of the RMD (Equation 2) and NMD (Equation 7) are independent of the corresponding effect sizes. 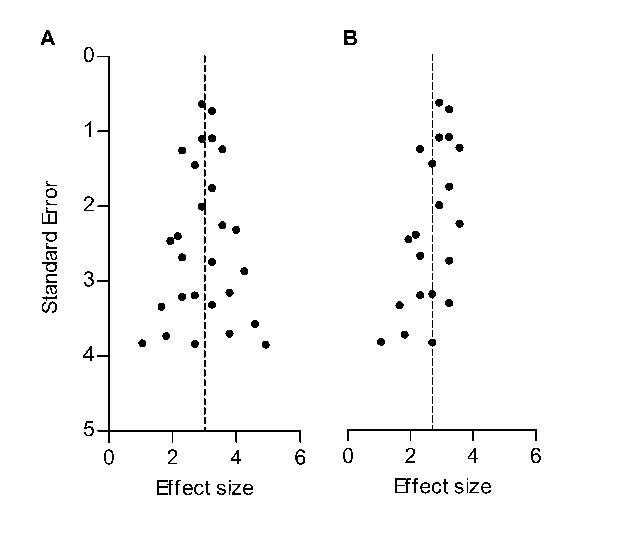 Funnel plots are scatter plots of the effect sizes of the included studies versus a measure of their precision, usually the SE or 1/SE. In the absence of bias and heterogeneity, funnel plots should be funnel-shaped and symmetrically centred around the summary effect estimate of the analysis, since 1) imprecise (smaller) studies will deviate further from the summary effect compared to precise (larger) studies and 2) studies are equally likely to overestimate or underestimate the true effect (Figure 1A). Assessment of the possible presence of publication bias frequently relies on a visual or analytical evaluation of funnel plot asymmetry. If studies showing small, neutral or controversial effects are more likely to remain unpublished, publication bias may occur. As a result, the funnel plot will become asymmetrical, and the summary effect estimate will shift accordingly (Figure 1B). Importantly, there are other causes of asymmetry in funnel plots. For instance, the true effect size in smaller (and therefore less precise) studies may be genuinely different from that in large studies (for instance because the intensity of the intervention was higher in small studies). For this reason, funnel plot asymmetry is often referred to as a method to detect small study effects, rather than being a definitive test for publication bias (Rothstein et al., 2005). In addition, artefacts and chance may cause asymmetry (as shown e.g. in this study). Hypothetical funnel plots in the absence (A) and presence (B) of bias. The precision estimate used is the standard error (SE). Dashed lines indicate the summary effect estimate. In a meta-analysis using the SMD as effect measure, in the absence of publication bias, observed SMDs in a funnel plot will be scattered around the true underlying SMD. However, the dependency of the SESMD on the observed SMD will impact the appearance of the funnel plot. When we review the equation for the SESMD, (Equation 5) the first component on the right of the ‘=' sign reflects the variance of the difference between the two group means, rescaled into pooled standard deviation units. Consequently, in this first part only nctrl and nint play a role. The second component includes the squared SMD, and reflects the variation in the within-groups standard deviation as measured by SDpooled (Equation 4). If there is no intervention effect, the SMD (and the second component) will be zero, and the SE will therefore depend solely on the sample size (Equation 5 and Figure 2A). If an intervention effect is present, the SE will increase, as the size of SMD2 in the equation will increase. This is no problem if the observed SMD is similar to the true SMD. However, a study with an observed SMD larger than the true SMD will have a larger SE. On the other hand, a study with an observed SMD smaller than the true SMD (but >0) will have a relatively small SE (Figure 2B). This will cause funnel plot distortion: studies with a relatively small effect size (and associated SE) will skew towards the upper left region of the plot, while studies with a relatively large effect size and SE will skew towards the bottom right region of the plot, as the associated SE of these studies will be relatively large. Because the SMD is squared in the equation for the SE, this holds true for both positive and negative SMDs (Figure 2C). The smaller the first component of Equation 5, the larger the influence of the SMD on the size of the SE, worsening the distortion when sample sizes are small. Of note, this component is smallest when group sizes are unequal. The effect of the second component on the SE, and the resulting distortion, is largest if the sample size is small and the SMD is large (Figure 2D). Step-wise illustration of distortion in SMD versus SE funnel plots. (A) Depicted are simulated studies with a sample size of respectively 10 (large black circles), 25 (blue squares), 50 (red triangles), 100 (small green circles) and 200 (gold asterisks) subjects per group, and an SMD of zero. The SE of these studies (indicated by the dashed line for studies with n = 10) solely depends on their sample size, as SMD2 = 0 and therefore does not contribute to the equation for the SE. As expected, the SE decreases as the sample size increases. (B) Five data points from simulated studies with n = 10 and a stepwise increasing SMD are added to the plot. For these studies, the SMD2 contributes to the equation for the SE, and the SE will decrease even though the sample size is constant. The dotted line represents a hypothetical summary effect of SMD = 1 in a meta-analysis. Note that when assessing a funnel plot for asymmetry around this axis, the data points with an SMD < 1 have skewed to the upper left-hand region, whereas studies with an SMD > 1 are in the lower right region of the plot. This distortion worsens as the SMD increases. (C) Because the SMD is squared in the equation for the SE, the same distortion pattern is observed for negative SMDs. Thus, funnel plots will be distorted most when the study samples sizes are small and SMDs are either very positive or very negative. (D) The same deviation is observed for simulated studies with larger sample sizes, however, the deviation decreases as the sample size increases, because the sample size will outweigh the effect of SMD2 in the equation for the SE. In summary, a funnel plot using both the SMD and its SE may become asymmetrical in the absence of publication bias. When funnel plot distortion is assessed by visual inspection, this skewing might cause the plot to be interpreted as being asymmetrical and lead the observer to erroneously conclude that publication bias is present. Furthermore, funnel plot asymmetry is often tested statistically using Egger’s regression (Egger et al., 1997) or Duval and Tweedie’s trim and fill analysis (Duval and Tweedie, 2000), but neither of these analyses take the phenomenon described above into account, and their use may lead to erroneous conclusions that publication bias is present. We investigated the reliability of RMD, SMD and NMD-based funnel plots for the assessment of publication bias in meta-analyses, using both empirical datasets and data simulations. We investigate the effect on the severity of funnel plot distortion of the study sample size, the number of studies in the meta-analysis and the magnitude of the intervention effect. We assess whether distortion can be avoided by using a precision estimate based on the sample size of the primary studies, as previously suggested for mean difference outcome measurements (Sterne et al., 2011). We then use this alternative approach to reanalyse published funnel plots, and show that these systematic reviews may have overestimated the severity of publication bias in their body of evidence. Our findings have important implications for the meta-research field, since authors may have reached incorrect conclusions regarding the existence of publication bias based on funnel plots using the SMD measure of effect size. Dataset 1 (ischaemic preconditioning) contains 785 individual effect sizes (Wever et al., 2015). In the original analysis using the RMD as effect measure, funnel plot asymmetry was detected by Egger’s regression (p=1.7×10−5), but no additional studies were imputed in trim and fill analysis (Figure 3A). When expressing the same data as SMD, funnel plot asymmetry increased substantially (Figure 3B; p<1.0×10−15, Egger regression) and 196 missing studies were imputed by trim and fill analysis, leading to adjustment of the estimated SMD effect size from 2.8 to 1.9. Reanalysis of data from Wever et al. (A,B) and Zwetsloot et al. (C,D), with funnel plots based on raw mean difference (RMD; A,D) or standardized mean difference (SMD; B,D). Filled circles = observed data points; open circles = missing data points as suggested by trim and fill analysis. Dataset 2 (stem cell treatments) contained 95 individual effect sizes (Zwetsloot et al., 2016). Funnel plot asymmetry was detected in the original analysis using RMD (p=0.02) and trim and fill analysis suggested a reduction in effect estimate of 0.1% after filling two additional studies (Figure 3C). In contrast, a funnel plot of the same data expressed as SMD showed asymmetry at a higher level of statistical significance (p=3.4×10−10, Egger regression), but no missing studies were imputed (Figure 3D). Results of our first simulation (in the absence of publication bias) are shown in Table 1, and representative funnel plots of these simulations in Figure 4 (small study sample size) and Figure 4—figure supplement 1 (large study sample size). When we simulated no intervention effect, neither Egger’s regression nor trim and fill analysis gave different results for the RMD vs. SE and SMD vs. SE analyses (Table 1, Figure 4A,B,E and F and Figure 4—figure supplement 1, panel A, B, E and F) and in ~95% of cases there was no evidence of asymmetry. Most simulated funnel plots were assessed as symmetrical, however, as expected, around 5% of the cases were considered asymmetrical by chance. Representative raw mean difference (RMD; A, C, E, G) and standardized mean difference (Hedges’ g SMD; B, D, F, H) funnel plots for simulated unbiased meta-analyses containing thirty (A–D) or 300 (E–H) studies with a small sample size (total study n = 12–30). Simulations were performed without an intervention effect (Δμ = 0; A–B and E–F), or with an intervention effect (Δμ = 10; C–D and G–H). Δμ = difference in normally distributed means between control and intervention group. Representative funnel plots for studies with a large sample size (total study n = 60–320) are shown in Figure 4—figure supplement 1. Representative funnel plots for the comparison between Hedges’ g and Cohen’s d are shown in Figure 4—figure supplement 2. When we simulated the presence of an intervention effect (Δμ = 10; RMD = 10 and SMD = 1 or Δμ = 5; RMD = 5 and SMD = 0.5), again around 5% of the RMD funnel plot analyses were judged asymmetrical (Table 1, Figure 4C and G, and Figure 4—figure supplement 1, panel C and G). In contrast, when using the SMD, funnel plot asymmetry was detected in over 60% of the simulated funnel plots with Δμ = 10, where the size of contributing studies was small (Figure 4D and H and Figure 4—figure supplement 1, panel D and H), increasing as the number of individual studies contributing to the meta-analysis increased. When we modelled larger individual contributing studies (n = 60–320 subjects), respectively 9%, 34% and 100% of the SMD funnel plots with 30, 300 or 3000 studies were assessed as asymmetrical (Table 1, Figure 4—figure supplement 1). Trim and fill analysis resulted in on average 7% extra studies filled in preclinical simulation scenarios using the RMD. Adjusting the overall effect estimate based on these filled data points improved the estimation of the simulated RMD in all scenarios. However, when using the SMD, the number of filled studies was much higher in many scenarios (up to 21% extra studies filled). As a result, the adjusted overall effect estimate after trim and fill in SMD funnel plots tended to be an underestimation of the true effect size. Finally, through visual inspection, distortion could be seen in all SMD funnel plots that incorporated a true effect, most prominent in the preclinical (small study) scenarios (Figure 4 and Figure 4—figure supplement 1). When repeating the simulations using Cohen’s d SMD instead of Hedges’ g, or using Begg and Mazumdar’s test, we found highly similar results in all scenarios simulated (see Supplementary file 1 and exemplary funnel plots in Figure 4—figure supplement 2). Next, we assessed the impact of censoring non-significant simulated experiments (to simulate publication bias) and the performance of SMD vs. 1/√n funnel plots and NMD funnel plots in the presence of an intervention effect as alternatives to the SMD vs. SE funnel plot. As in simulation 1, SMD vs. SE funnel plots of unbiased simulations were identified as asymmetrical by Egger’s test (Table 2). However, when the precision estimate was changed from SE to 1/√n, the prevalence of false positive results fell to the expected 5% (Table 2). For the NMD, Egger’s test performed correctly when using either the SE or 1/√n as precision estimate. In all scenario’s, approximately 50 out of 1000 simulated funnel plots appeared to be asymmetrical by chance (Table 2). The results of Egger’s test are supported by visual inspection of funnel plots of these unbiased scenario’s (Figure 5). The typical left-upward shift of the small SMD datapoints and right-downward shift of the large SMD data points is clearly visible in the SMD vs. 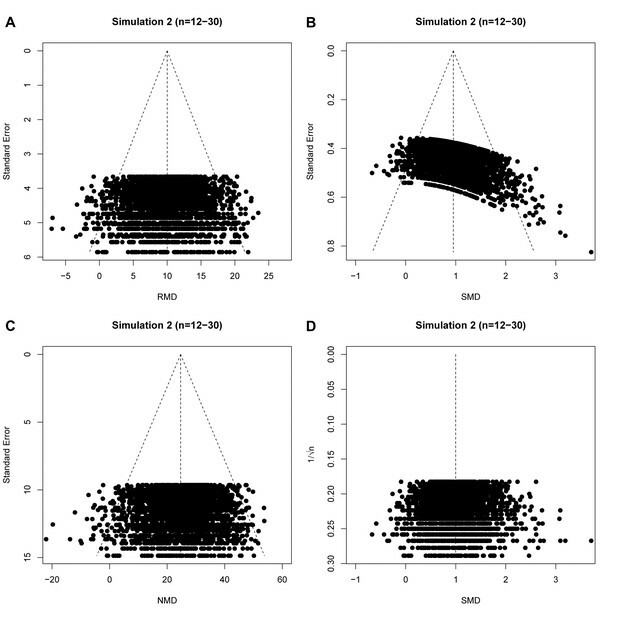 SE plot (Figure 5B), but not in the RMD, SMD vs. 1/√n or NMD plots. publication bias assessments in unbiased and biased simulations using the RMD, SMD or NMD in combination with an SE or sample size-based precision estimate (simulation 3). Simulated meta-analyses contained 300 studies (total study n = 12–30 subjects) and the difference in normally distributed means between control and intervention group was 10. Publication bias was introduced stepwise, by removing 10% of primary studies in which the difference between the intervention and control group means was significant at p<0.05, 50% of studies where the significance level was p≥0.05 to p<0.10, and 90% of studies where the significance level was p≥0.10. SE = standard error; RMD = raw mean difference; SMD = standardized mean difference (Hedges’ g); NMD = normalized mean difference; sims = simulations. raw mean difference (RMD; A), standardized mean difference (SMD; B), normalized mean difference (NMD; C) with SE as precision estimate, and SMD funnel plots using 1/√n as precision estimate (D). All plots show the same simulated meta-analysis containing 3000 studies with small sample sizes (n = 12–30) and an overall intervention effect of Δμ = 10. Δμ = difference in normally distributed means between control and intervention group. In our final simulation we tested the performance of these different approaches in the presence of simulated publication bias. In the majority of these simulations of meta-analyses of individually small studies, asymmetry was detected both visually (Figure 6), and using Egger’s regression (Supplementary file 1). When the size of individual studies was small, SMD vs.1/√n funnel plots performed as well as the RMD vs. SE funnel plots, in both biased and unbiased simulations (Table 2). The NMD also behaved similar to the RMD with either an SE or 1/√n precision estimate. Simulation 3 funnel plots of biased meta-analyses. 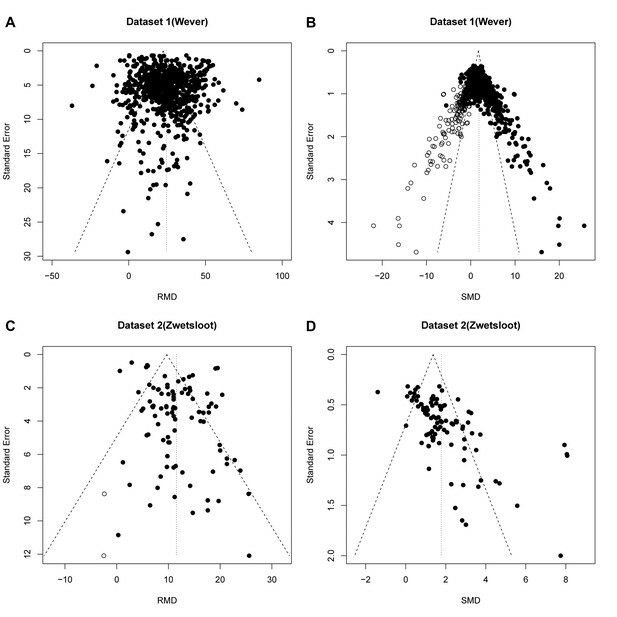 Representative funnel plots of simulated biased meta-analyses using a raw mean difference (RMD; A–B), a standardized mean difference (SMD; C–D), or a normalised mean difference (NMD; E–F) effect measure. The present example contains 3000 studies with a small study sample size (n = 12–30) and an intervention effect present (difference in normal distribution means between control and intervention group = 10). Publication bias was introduced stepwise, by removing 10% of primary studies in which the difference between the intervention and control group means was significant at p<0.05, 50% of studies where the significance level was p≥0.05 to p<0.10, and 90% of studies where the significance level was p≥0.10. Precision estimates are standard error (A, C, E) or sample size-based (B, D, F), where n = total primary study sample size. Since a sample size-based precision estimate might be more suitable for asymmetry analysis, we used data from five previously published meta-analyses which used an SMD vs. SE funnel plot and claimed funnel plot asymmetry as a result of publication bias. In the original publications, all five of these funnel plots were asymmetrical according to Egger’s regression test. In three out of five cases, this asymmetry was not present in funnel plots using 1/√n as a precision estimate (Table 3 and Figure 7). Furthermore, three out of five papers reported several missing data points, as detected by trim and fill analysis. Missing data points were not detected when using SMD vs. 1/√n funnel plots for trim and fill analysis (Table 3 and Figure 7). n = number of studies; SMD = standardized mean difference; CI = confidence interval; Egger’s p=p value for Egger’s regression; adjusted SMD = SMD after trim and fill analysis; N/A = not applicable. Funnel plots of re-analysis of empirical meta-analyses. Funnel plots of empirical meta-analyses plotted as standardized mean difference (SMD) versus standard error, as in the original publications (left hand panels), and as SMD versus 1/√n after re-analysis. n = total primary study sample size; filled circles = observed data points; open circles = missing data points as suggested by trim and fill analysis. Using data from both simulated and empirical meta-analyses, we have shown that the use of Egger’s regression test for funnel plot asymmetry based on plotting SMD against SE is associated with such a substantial over-estimation of asymmetry as to render this approach of little value, particularly when the size of contributing studies is small. This distortion occurs whenever an intervention effect is present, in meta-analyses both with and without publication bias. The severity of distortion and the risk of misinterpretation are influenced by the sample size of the individual studies, the number of studies in the meta-analysis, and the presence or absence of an intervention effect. Thus, the use of SMD vs. SE funnel plots may lead to invalid conclusions about the presence or absence of publication bias and should not be used. 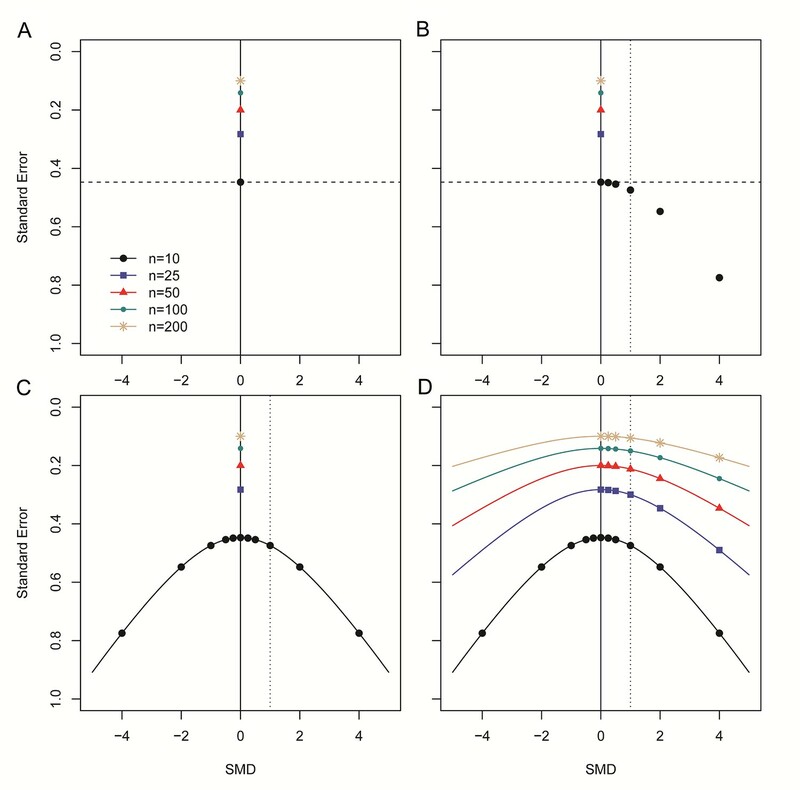 Since it is the association between the SMD and its SE that leads to funnel plot distortion, it almost inevitable that the issues described will occur with any test for publication bias that relies on an assessment of funnel plot asymmetry (e.g. Begg and Mazumdar’s test [Begg and Mazumdar, 1994]). When using trim and fill analysis, funnel plot distortion introduces the risk of incorrectly adjusting the summary effect estimate. Previous reports of the presence of publication bias based on this approach should be re-evaluated, both for pre-clinical and clinical meta-analyses. Importantly, distortion does not occur in NMD vs. SE funnel plots, which formed the basis of a recent analysis showing evidence for substantial publication bias in the animal stroke literature (Sena et al., 2010). As the use of meta-analysis to summarize clinical and preclinical data continues to increase, continuous evaluation and development of research methods is crucial to promote high-quality meta-research (Ioannidis et al., 2015). To our knowledge (see also Sterne et al., 2011), potential problems in tests for funnel plot asymmetry have not been extensively studied for SMDs, and guidance is limited. For instance, the Cochrane Handbook for Systematic Reviews of Interventions (Yan et al., 2015) states that artefacts may occur and that firm guidance on this matter is not yet available. It is disquieting that publication bias analyses using SMD funnel plots have been published in clinical and preclinical research areas, presumably because both the authors and the peer reviewers were unaware of the risk of spurious publication bias introduced by this methodology. Accepted papers from our group and others using SMDs for publication bias assessments have passed the peer review system, with no additional questions and or comments on this potential problem. A similar phenomenon has been reported for the use of odds ratios in funnel plots, which also induces artificial significant results in Egger’s regression (Peters et al., 2006). Here, too, an alternative test based on sample size has been proposed to circumvent this problem (Peters et al., 2006), and we suggest to extend this recommendation to SMDs. However, given the relative performance of the RMD, NMD and SMD approaches, it is reasonable to consider whether SMD should ever be used. The RMD approach is limited because there are many instances (for example across species) where, although the same units of measurement are used, a given change may have very different biological importance. The NMD approach is preferred, but – because it expresses the effects of an intervention as a proportion of lesion size – there may be circumstances where outcome in a non-lesioned animal is not reported or cannot be inferred, and here the NMD approach is not possible. Further, the relative performance of RMD, NMD and SMD approaches in identifying heterogeneity between groups of animal studies (partitioning of heterogeneity) or in meta-regression is not known. Taken with the increased distortion seen when contributing studies are individually small, this means our findings may be especially relevant for preclinical meta-analyses. The SMD is frequently used in preclinical meta-analyses to overcome expected heterogeneity between data obtained from different animal species. Nevertheless, the SMD is also used in clinical meta-analyses and the degree of distortion cannot be readily predicted. In any case, distortion causes the threshold for determining publication bias to be artificially lowered when using SMDs and their SE, increasing the chance of false-positive results. Of note, trim and fill analysis may not always be reliable when the number of studies in a meta-analysis is large; in half of the cases of our unbiased simulations with 300 and 3000 studies, many studies were deemed missing, even if no intervention effect was introduced. Still, the SMD simulations were always more susceptible to the addition of imputed studies if a true effect was introduced, and the effect size reduction was larger compared to RMD measurements. We designed our data simulations to closely resemble empirical data in terms of the range of sample sizes, effect sizes and numbers of studies in a meta-analyses. We acknowledge that our current range of simulation scenarios does not enable us to predict the impact of funnel plot distortion in every possible scenario, but we present those scenarios which most clearly illustrate the causes and consequences of funnel plot distortion. Furthermore, our simulations may still be improved by e.g. studying the effects of unequal variances between treatment groups, sampling data from a non-normal distribution, or introducing various degrees of heterogeneity into the simulation. However, research on how to optimally simulate these parameters is first needed, and was beyond the scope of this study. instead, we used re-analyses of empirical data to test our proposed solutions on a number of real-life meta-analyses which include all of the aforementioned aspects. We recommend that, where possible, investigators use RMD or NMD instead of SMD when seeking evidence of publication bias in meta-analyses. Where it is necessary to use SMD, assessment for publication bias should use a sample size-based precision estimate such as 1/√n. In a given analysis it may be possible to calculate an NMD effect size for some but not all studies. In these circumstances there is a trade-off between the reduced number of included studies and an improved estimation of publication bias, and sensitivity analysis may be used to compare the meta-analysis outcome using the NMD versus the SMD. Of note, other methods to investigate publication bias in a dataset may be used in addition to funnel plots (e.g. fail-safe N, Excess Significance Test [Ioannidis and Trikalinos, 2007], or selection method / weight funcion model approaches [Peters et al., 2006]), but the performance of these approaches in the context of SMD, RMD and NMD estimates of effect size is not known. In conclusion, funnel plots based on SMDs and their SE should be interpreted with caution, as the chosen precision estimate is crucial for detection of real funnel plot asymmetry. We performed data simulations and re-analyses of empirical data using R statistical software (version 3.1.2; RRID:SCR_001905) and the most recent MBESS, xlsx, meta and metafor packages (Rothstein et al., 2005; Kelley, 2016; Schwarzer, 2016; Viechtbauer, 2010; Dragulescu, 2014) (See Supplementary file 3 for all R scripts). For all analyses involving RMD and SMD the primary outcome of interest was the number of asymmetrical funnel plots as detected by Egger's regression (Egger et al., 1997). As a secondary outcome, we assessed the number of missing studies as imputed by Duval and Tweedie’s trim and fill analysis (Duval and Tweedie, 2000). This method provides an estimate of the number of missing studies in a meta-analysis, and the effect that these missing studies may have had on its outcome. In brief, the funnel plot is mirrored around the axis represented by the overall effect estimate. Excess studies (often small, imprecise studies with a neutral or negative effect size) which have no counterpart on the opposite side of the plot are temporarily removed (trimmed). The trimmed plot is then used to re-estimate the overall effect estimate. The trimmed data points are placed back into the plot, and then a paired study is imputed with the same precision but reflected to have an effect size reflected around the adjusted overall estimate, and plotted in a different color or symbol from the observed data points. The analysis is re-run and repeated until no further asymmetry is observed. We used trim and fill analysis and a random effects model in R to seek evidence for publication bias overstating the effectiveness of the interventions, based on the proposed direction of the intervention effect. Because of its superior performance in studies with small sample sizes, Hedges’ g was used in the main analyses throughout this manuscript. We considered a p-value of <0.05 to be significant for Egger’s regression in individual simulations. In our first re-analysis of empirical data from published preclinical meta-analyses (Wever et al., 2015; Zwetsloot et al., 2016), we constructed funnel plots using the unbiased SMD (Hedges’ g [Hedges, 1981]) vs. SE, and compared these to funnel plots using the RMD vs. SE (as in the original publication). In our first simulation, we tested the estimation of publication bias using the unbiased SMD (Hedges’ g) in simulated data where there was no publication bias. As a sensitivity analysis, all scenarios of simulation 1 were also performed using Cohen’s d. We generated simulated meta-analyses by simulating the desired number of individual studies, each with a control group and an intervention group. The control groups were simulated by randomly sampling individual subject data from a normal distribution with a mean (Mctrl) of 30 and an SD of 10 (Table 4); these values were based on outcome data for functional imaging in myocardial infarction studies (Zwetsloot et al., 2016). Individual subject data for the intervention group was sampled from a normal distribution with mean Mctr +ES (effect size). To assess the effect of differences in overall intervention effects on funnel plot distortion, we simulated meta-analyses for an ES of respectively 0, 5, or 10 (Table 4). To assess the effect of study sample size on funnel plot distortion, we simulated two types of study sizes: small (12–30 subjects per study), as is more common in animal studies, and large (60–320 subjects per study), as is more common in human studies. For each simulated study, we determined the number of subjects by sampling the group sizes from the uniform distribution within the ranges of study sizes given (Table 4). Of note, an intervention effect of SMD = 1 may appear large to those experienced in meta-analyses of clinical data, but is typical of those observed in animal studies, as are the group sizes reported (see e.g. Figure 2 and Table 3). n = sample size; ND = normal distribution; SD = standard deviation; *control group sample size = intervention group sample size ±≤2 (small studies) or ±≤20 (large studies). Simulation and aggregation of individual subject data into study-level data was repeated until the desired number of studies to be included in the meta-analysis was obtained. We assessed the influence of the number of included studies on funnel plot distortion by simulating meta-analyses containing either 30, 300, or 3000 studies. Although there is no consensus on the minimal number of studies required for publication bias analysis, 30 has been previously proposed as the minimal number to obtain sufficient power for asymmetry testing (Lau et al., 2006). We chose 3000 studies for the largest meta-analysis as this is substantially larger than any meta-analysis of which we know, and any effects of study number are likely to be saturated at that number of studies. Importantly, we did not introduce publication bias to any of these datasets and the funnel plots should therefore be symmetrical. We repeated each simulation 1000 times, and we compared the effects of expressing the meta-analysis results as RMD or SMD, and used funnel plots with the effects size plotted on the x-axis and the SE as precision estimate plotted on the y-axis (RMD vs. SE and SMD vs. SE plots). As a second sensitivity analysis, we assessed the robustness of our findings using Egger’s test by re-testing all scenario’s of simulation 1 using Begg and Mazumdar’s test (Begg and Mazumdar, 1994). Informed by the outcomes of simulation 1, in our second simulation we selected the conditions introducing the most prominent distortion in SMD vs. SE funnel plots to investigate the performance of alternatives including SMD vs. 1/√n funnel plots and NMD funnel plots. Thus, all simulations were performed with a small study sample size, in the presence of an intervention effect (see Table 4) and with 3000 studies per meta-analysis. Under these conditions, we constructed RMD vs. SE and SMD vs. SE funnel plots as described above, as well as funnel plots of the SMD against the inversed square root of the total sample size (1/√n) in each study, and of the NMD against the SE. For the NMD, sham group data were simulated to have a mean of 70 and an SD of 4 (Table 4). Group size was selected to be 4–6 subjects, which is a typical sample size for sham groups in preclinical experiments. We performed the simulations once and compared outcomes across all four funnel plots. In our final simulation we investigated the effects of a modelled publication bias on the performance of the SMD vs. SE and alternative approaches. We simulated meta-analyses containing 300 and 3000 studies with a small individual sample size and an intervention effect present (Δμ = difference in means between control and intervention group = 10; see Table 4). RMD vs. SE, RMD vs. 1/√n, SMD vs. SE, SMD vs. 1/√n and NMD vs. SE funnel plots were constructed and tested for asymmetry using Egger’s regression. We then introduced publication bias in these meta-analyses using a stepwise method, Publication bias was introduced stepwise, by removing 10% of primary studies in which the difference between the intervention and control group means was significant at p<0.05 (Student-t test), 50% of studies where the significance level was p≥0.05 to p<0.10, and 90% of studies where the significance level was p≥0.10. Funnel plot asymmetry testing was performed as above, and the results were compared to the unbiased simulations and between different funnel plot types. All simulations were repeated 1000 times. Of note, this simulation was not performed for meta-analyses of studies with a large sample size, since pilot data showed that the large sample size will cause only very few studies to be removed from the ‘biased’ meta-analysis. Finally, to assess the usefulness and impact of using a sample size-based precision estimate in SMD funnel plots of empirical data, we re-analysed data from five published preclinical meta-analyses that used SMD vs. SE funnel plots to assess publication bias. The selected datasets were from our own groups, or from recent collaborations, which allowed for easy identification of meta-analyses using SMD vs. SE funnel plots, and easy access to the data. There were no selection criteria in terms of e.g. the number of studies in the analysis, or the outcome of the publication bias assessment. The distribution of the total number of subjects per data point in the selected studies is (in median (min-max): 11.7 (6–38) for Wever et al. (2012), 20(12-46) for Groenink et al. (2015), 11(4-24) for Yan et al., 2015, 14.5 (6–35) for Kleikers et al. (2015) and 12(4-66) for Egan et al. (2016). For these data sets, we compared the outcome of Egger’s regression and trim and fill analysis when using SMD vs. SE funnel plots to that of SMD vs. 1/√n funnel plots. We obtained the corresponding author’s consent for re-analysis. European Journal of Pharmacology 753:191–208. Journal of Educational Statistics 6:107. Journal of Neuroscience Methods 221:92–102. Tissue Engineering Part B: Reviews 21:411–426. Thank you for submitting your work entitled "Standardized mean differences cause funnel plot distortion in publication bias assessments" for consideration by eLife. Your article has been favorably evaluated by a Senior Editor and three reviewers, one of whom, M Dawn Teare (Reviewer #1), is a member of our Board of Reviewing Editors. The following individuals involved in review of your submission have agreed to reveal their identity: Marcus Munafo (Reviewer #2); Jack Vevea (Reviewer #3). The reviewers have recognised this is an important topic but you have not really presented what the impact of this problem is. There are many queries relating to selection of simulation parameters, choice of statistic and test, and what the impact is in realistic practice. Addressing these issues will likely exceed the time span for major revisions in eLife (two-three months), so we are rejecting the paper now but would welcome a resubmission in the future, with no guarantees of acceptance or re-review. This should be a de novo submission, and we would endeavour to recruit the same editors to assess the revisions. This manuscript identifies an important potential problem when using the SMD in meta-analyses. When sample sizes are small and effect sizes large, funnel plots using SMD vs. SE can show asymmetry and hence suggest evidence of publication bias when there is none. The authors demonstrate that this issue should not be so surprising as the SMD SE is a function of the effect size and hence studies with small sample sizes will tend to show a bias. Meta analyses that contain large numbers of studies are therefore more likely to show this effect. This could be an important issue as the meta-analysis may over correct the SMD and actually lead to an underestimate of an effect size. This manuscript has a clear simple message that using funnel plots of the SMD vs. 1/√n do not result in the same bias. I do have a number of concerns with the paper especially as they do not tackle the issue of what is the impact on the overall estimate of the effect size resulting from such meta-analyses. My understanding is that the funnel plot, trim and fill is used to estimate corrected effect sizes (so if publication bias is suspected the SMD is adjusted). This manuscript has not really focused on the impact on the overall estimates coming out of meta-analyses. 1) Hedges' g is often reported for studies of small sample size rather than Cohen's d, but the authors appear to have not performed their simulations using this version. (Apart from a single figure shown in the supplementary methods). It seems odd not to have fully evaluated the performance of both summary measures. 2) The simulations have only been performed under quite a limited number of scenarios, the null, for one very large effect size and then for a specific form of publication bias. Though a range of sample sizes has been explored. While this is helpful to show the weakness in the method researchers will want to know when it is important. Is an effect size of 1SD a realistic effect size in practice? Surely if an effect size is so large as that not many studies will be required to confirm it. Table 3 shows scant details of the 5 meta-analyses. It seems intriguing that one of these meta-analyses included almost 1400 studies? I have looked up that reference and while they have looked for evidence of publication bias in all the various studies, it does not seem sensible to have pooled all of the studies for this analysis. 3) Much more detail on the meta analyses and why they were selected. What was the impact on the estimates of SMD using the different funnel plots? What was the distributions of sample sizes and SMDs in the studies making up each meta-analysis? The authors highlight an interesting aspect of commonly used tests to assess for the presence of small study bias, which may be caused by publication bias. This is supported by analyses of simulated and real data. My main comment is that there are other tests (e.g. Begg and Mazumdar). Do the issues described here apply to all tests, and if so does the extent to which they do so differ (in which case, which is superior)? It may also be worth briefly discussing other approaches, such as the Excess Significance Test developed by Ioannidis, that rely on different assumptions and therefore allow triangulation of methods. This manuscript presents a simulation study looking at the identification of publication bias for measures of effect size based on the difference between means: standardized mean difference (SMD), raw mean difference (RMD), and normalized mean difference (NMD). Using Egger's regression and Duval and Tweedie's trim and fill analysis to detect funnel plot asymmetry, the authors discover a problem of overidentification for SMD when analysis is based on funnel plots of SMD against standard error. Overidentification of publication bias was found to be much greater for SMD in comparison to RMD and NMD. This problem was found to be mitigated by plotting SMD against 1/√n. The authors provide a good description of the different types of measures of effect size. However, they provide only a mention of Hedges' g in the fourth paragraph of Section 1.1. Many practitioners incorrectly use the term g and d interchangeably, and a description of how these two estimates are different will be beneficial. Related to this, in the following sentence the paper describes the shortcomings of SMD when the sample size is small. It would be useful to point out that Hedges' bias-corrected estimate is meant to address bias when sample sizes are small (Hedges, 1981). In Section 1.2, the authors describe the relationship between funnel plot asymmetry and publication bias. It would also be worth pointing out that funnel plot asymmetry does not necessarily indicate publication bias. There are other reasons why funnel plots may appear asymmetrical, such as systematic heterogeneity related to the inclusion of two different modes of inquiry that differ both in effect magnitude and in typical standard error. There are two sections of the paper with the heading "Data Simulations" (Section 2.2 and Section 4.1). Results of the simulations are in Section 2.2. Section 4.1 is at the end of the paper and describes the process for simulating the data. This organization is confusing. It would be better if the description of the simulation were provided before these results, as it provides context for understanding the outcome of the author's simulation. Also, headings that clearly define these different sections will make it easier for readers to navigate the article. In the third paragraph of Section 2.2 the authors state that results were similar for Cohen's d and Hedges' g effect-size estimates. Based on the information in the paper (Figure 3 legend and Figure 3—figure supplement 2), it appears that the comparisons for these estimates were only made using large sample sizes. In this case, similar results would be expected. They would be more likely to have different results in cases where sample sizes are small, as d and g are more-or-less identical for large sample sizes. The authors should address this scenario as well and make it clear that the information provided uses the Hedges’ g bias-corrected estimate of effect size. In the fourth paragraph of Section 2.2 the authors use SMD-1/√n to refer to their analysis of funnel plots looking at SMD with 1/√n on the y axis. The hyphen could be interpreted as arithmetic minus sign, so additional clarity of notation is needed. In the fourth paragraph of Section 2.2 the authors state that the distortion is not seen in plot D of Figure 4. Visual interpretation of funnel plots is subjective. To some readers, the plot will continue to appear asymmetric, but flatter. The authors should explain what details of the plot lead them to the conclusion that the plot was symmetric as well as plots A and C, which are also described as not indicating distortion. In Table 2, the authors of this study operationalize publication bias by removing all studies with a p-value ≥.10. This operation means that studies with a p-value above the cutoff have no chance of being published, and all studies with a p-value below (e.g. p=.09 and p=.01) have equal certainty of publication. This specification is not a good reflection of how publication bias functions in the real world. The authors should provide justification for using a simple cutoff of a p-value, rather than a model with diminishing probability such as a step function or a decaying continuous function. The authors should also include their reasoning for setting the cutoff at p ≥}.10, as well as information on how many studies were excluded based on this cutoff, such as the average number of studies remaining in the analysis. In Section 2.3, the authors compare the results of the analyses using examples from real-world studies. Providing this shows how their research may be applicable in real world settings. It would also be useful to report effect-size estimate from the original meta-analysis. The Discussion section is missing a discussion of the limitations of the current study. The simulation had a limited number of conditions. Providing limitations identifies the scope of the presented findings. Also, the authors should include a rationale explaining why they got these results Without that, the findings atheoretical; entirely empirical methodological findings are harder to accept with confidence. In the first paragraph of Section 4.1, the authors describe the process for obtaining individual study sample sizes in the simulation. They should provide a rationale for sampling study sample sizes from a uniform distribution. Sample sizes typically do not follow a uniform distribution; rather they tend to be positively skewed. This brings into question the relevance of the simulations. In Table 4 legend the authors describe the magnitudes for the effect sizes included in the simulation. They should provide a reasoning for using an effect magnitude of SMD=1. By many standards, this would be considered a very large effect. It is possible that the method would perform better (or worse) under conditions where the population magnitude is small or moderate. Also, the simulation did not include heterogeneity of studies in the model: all studies were sampled from exactly the same fixed-effect distribution. Studies conducted in the real world tend to have heterogeneity. Conditions of heterogeneity often lead to failure of trim and fill and Eggers regression, and would influence the outcome of an analysis of publication bias. […] I do have a number of concerns with the paper especially as they do not tackle the issue of what is the impact on the overall estimate of the effect size resulting from such meta-analyses. My understanding is that the funnel plot, trim and fill is used to estimate corrected effect sizes (so if publication bias is suspected the SMD is adjusted). This manuscript has not really focused on the impact on the overall estimates coming out of meta-analyses. Although not our primary outcome, we have added the results of trim and fill analyses for simulation 1 to Table 1. These results indicate that using trim and fill in SMD vs. SE funnel plots will, in the majority of scenarios tested, lead to an overestimation of the number of missing studies and, as a result, and underestimation of the overall effect estimate after trim and fill. We have added these results to the manuscript text and Table 1. Indeed, Hedges’ g provides a more appropriate estimate of the SMD for studies with small sample sizes, which is why all simulations and re-analyses were performed in Hedges’ g. We infer from your question that this aspect of the methodology was not stated clearly enough, and have therefore improved the description in the first paragraph of the Materials and methods and Results sections to make it more clear that we used Hedges’ g in all main analyses. We also agree that it is worthwhile to report the comparison between Hedges’ g and Cohen’s d more extensively. We have therefore extended Supplementary file 1 to include the results for all scenarios of simulation 1 in Hedges’ g and Cohen’s d, so that these can be easily compared. We have also extended Figure 4—figure supplement 2 with additional plots in both Hedges’ g and Cohen’s d. The data presented provide further support for our conclusion that the differences between the results of simulations using Hedges’ g versus those using Cohen’s d are marginal (see also Supplementary file 1). Related to this, we have also added a more detailed description of the difference between Hedges’ g and Cohen’s d, because the two estimates are often confused (see reviewer 3, first comment). 2) The simulations have only been performed under quite a limited number of scenarios, the null, for one very large effect size and then for a specific form of publication bias. Though a range of sample sizes has been explored. While this is helpful to show the weakness in the method researchers will want to know when it is important. Is an effect size of 1SD a realistic effect size in practice? Surely if an effect size is so large as that not many studies will be required to confirm it. The chosen intervention effect size RMD = 10 / SMD =1 was based on empirical data from preclinical meta-analyses, where such large effects are commonly observed. For instance, all meta-analyses re-analyzed in this manuscript have overall effect sizes (considerably) larger than RMD=10 (Figure 1) or SMD=1 (Table 3). However, we appreciate that this effect size may seem very large to investigators accustomed to clinical meta-analyses, where effect sizes are often much smaller. We therefore appreciate your suggestion to extend our simulation scenarios with a smaller intervention effect size, and have performed additional simulations with an effect size of RMD=5 / SMD = 0.5. The results are presented in Table 1 (and also Supplementary file 1). We show that funnel plot distortion can also occur in these scenarios. The number of positive Egger’s tests in these unbiased simulations increased (sometimes dramatically) in nearly all scenario’s, regardless of the inserted effect size. We have also added a sentence explaining the rationale behind the chosen effect sizes to Section 4.1. Furthermore, we have added the fact that our simulations do not cover the entire spectrum of possible simulations scenarios as a limitation of this study under Section 3.1 Limitations. Section 2.2: updated text and Table 1 with RMD =5 / SMD = 0.5 simulation results. Section 4.2: updated text and Table 4 with methodological details on new simulation scenarios with RMD =5. Table 3 shows scant details of the 5 meta-analyses. It seems intriguing that one of these meta-analyses included almost 1400 studies? I have looked up that reference and while they have looked for evidence of publication bias in all the various studies, it does not seem sensible to have pooled all of the studies for this analysis. We agree with the reviewer that the decision whether or not to pool heterogeneous results from animal studies is a recurrent matter of discussion, and should be carefully considered for each meta-analysis of animal studies. 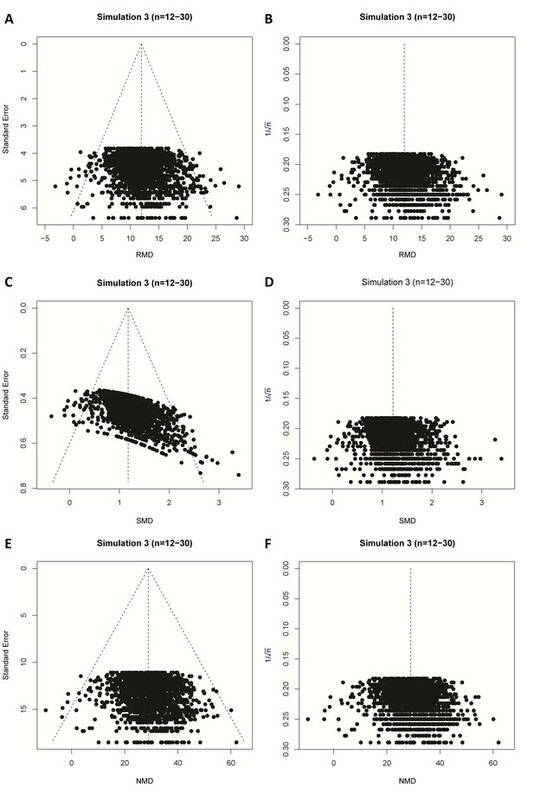 However, our goal here is not to assess whether the authors of the published meta-analysis made the correct decision in pooling these 1400 studies for their publications bias assessment, but rather to show that their use of an SMD versus SE funnel plot led to an overestimation of publications bias in their analysis. We chose this example especially because the pattern of skewing in the published SMD versus SE plot led to a high number of imputed studies. This is why we present the authors’ published analysis as published, and compare the results with the SMD versus 1/√n analysis. 3) Much more detail on the meta analyses and why they were selected. The selected datasets were from our own groups, or from our recent collaborations. This allowed for easy identification of meta-analyses using SMD vs. SE funnel plots, and easy access to the data required for re-analysis. We did not apply any selection criteria to the datasets, other than consent of the corresponding author. We limited the number of empirical examples to 5, because we felt that any more examples would be redundant. In addition to these practical advantages, we feel that we present the need for implementation of our approach best by reflecting critically on our own past work and point out limitations, rather than by directly criticizing the work of others. We have provided additional information in the text to better describe how the datasets were selected. What was the impact on the estimates of SMD using the different funnel plots? What was the distributions of sample sizes and SMDs in the studies making up each meta-analysis? We have now reported the original overall effect estimate, as well as the adjusted overall effect estimates after trim and fill in Table 3. The range of SMDs in the studies making up each meta-analysis can be most easily examined using the funnel plots in Figure 6, by looking at their distributions along the x-axis. The distribution of the total number of subjects per data point in the selected studies is (in median(min-max)): 11.7(6-38) for Wever et al.2012, 20(12-46) for Groenink et al.2014, 11(4-24) for Yan et al. 2015, 14.5(6-35) for Kleikers et al. 2015 and 12(4-66) for Egan et al. 2016. We have added these data to the Materials and methods section. These ranges of sample sizes are also reflected in the y-axis of those funnel plots where 1/√n is used a precision estimate. […] My main comment is that there are other tests (e.g. Begg and Mazumdar). Do the issues described here apply to all tests, and if so does the extent to which they do so differ (in which case, which is superior)? Thank you for this interesting suggestion. We focus on the performance of Egger’s test since this is the test most commonly used in practice. However, based on our theoretical explanation of how the association between the SMD and its SE leads to funnel plot distortion, it is almost inevitable that the issues described will occur with any test that relies on an assessment of funnel plot asymmetry to detect publication bias (such as the method of Begg and Mazumdar, and others). As an example, we have investigated the performance of Begg and Mazumdar’s test, the results of which are shown in Supplementary file 1. We found that this test indeed results in overestimation of funnel plot asymmetry, highly similar to Egger’s regression. It seems to yield slightly lower number of false-positive results in scenarios with few studies, but this is likely due to the fact that Begg and Mazumdar’s test has been shown to have lower power than Egger’s test when the number of studies is low (Sterne et al. 2000 JCE). We propose to present the results of Begg and Mazumdar’s test for simulation 1 in Supplementary file 1, and to mention the result of this analysis in brief in the results and Discussion sections. We have made additions to the text accordingly. For the reviewers interest, we present below the results for Table 2 using Begg and Mazumdar’s test, which also shows only marginal differences with those of Egger’s test (Table 2). Supplementary file 1: results of Begg and Mazumdar’s test are now included for simulation 1. The aim of our study is to promote the correct use of funnel plots for publication bias assessments. We agree that methods not relying on funnel plots may provide suitable alternatives, and have discussed such methods in Section 3.2 Recommendations. We agree that the Excess Significance Test should be mentioned here as well and have added it to the list of proposed alternatives. Of note, the performance of this test with continuous outcome measures has not been thoroughly evaluated, which is why we recommend it to be used cautiously. […] The authors provide a good description of the different types of measures of effect size. However, they provide only a mention of Hedges' g in the fourth paragraph of Section 1.1. Many practitioners incorrectly use the term g and d interchangeably, and a description of how these two estimates are different will be beneficial. Thank you for your compliment and suggestion, we have added a more detailed description of the difference between Hedges’ g and Cohen’s d to the Introduction. Related to this, in the following sentence the paper describes the shortcomings of SMD when the sample size is small. It would be useful to point out that Hedges' bias-corrected estimate is meant to address bias when sample sizes are small (Hedges, 1981). We fully agree and have now incorporated the shortcoming in the estimation of the variance in Cohen’s d into the description of the difference between Cohen’s d and Hedges’ g (see response to reviewer 3, first comment). We agree and have therefore added an explanation of the fact that asymmetry may result from different sources to the Introduction. Thank you for pointing this out. We followed eLife’s guidelines for authors when organizing the sections of the manuscript, which dictate that the Materials and methods section should come last, after the Results and Discussion. We have, however, changed the titles of the subheadings of Section 2.2 and 4.1 to avoid confusion of the sections. 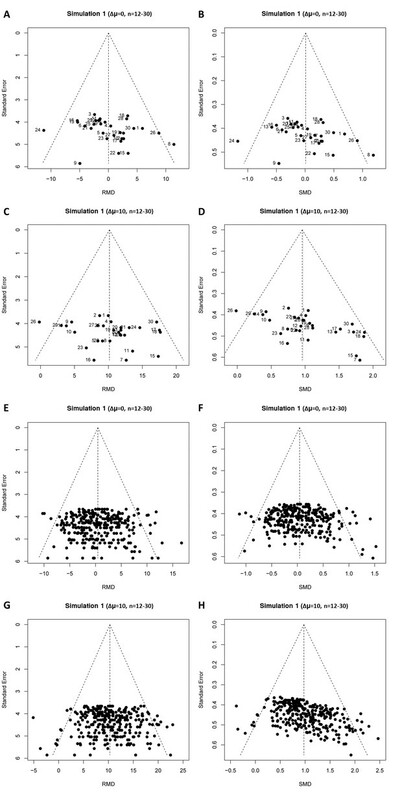 We apologize for the confusion, the plots in Figure 4—figure supplement 1 are in fact of simulations with small sample sizes (n=12-30; 3000 studies). We have improved the figure legend to state this more clearly. In addition, we agree that it is worthwhile to present a more elaborate comparison of Hedges’ g with Cohen’s d, as also suggested by reviewer 1. We have therefore re-run all simulations in Cohen’s d and present the results of both methods in Supplementary file 1. The data presented further strengthen our conclusion that there are no apparent differences between the results of simulations using Hedges’ g versus those using Cohen’s d. To illustrate this more extensively, we have updated supplemental Figure 2 to include panels for all effect sizes (SMD=0, SMD=0.5 and SMD=1). Figure 4—figure 2: added panels for SMD = 0 and SMD = 0.5, adjusted figure legend. Thank you for this helpful comment, which was also mentioned by reviewer #1. As mentioned above, we have replaced “SDM-”, “NMD-” and “RMD-” with “SMD vs.”, “NMD vs.” or “RMD vs.” throughout the manuscript, to avoid confusion of the hyphen with the minus sign. 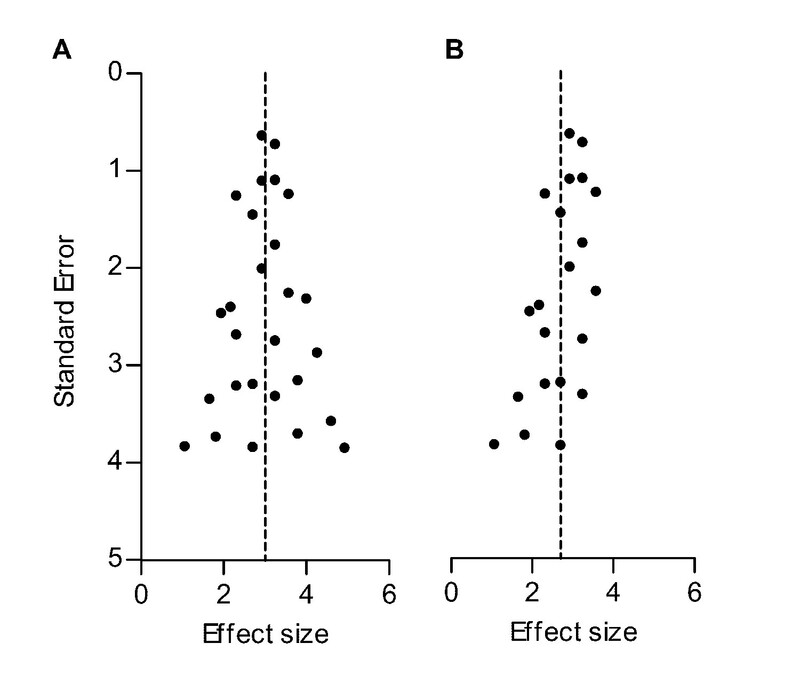 We agree that it is important to emphasize that visual inspection of funnel plots is subjective, and that the results of Egger’s regression test (reported in Table 2) were leading in our conclusions on funnel plot (a)symmetry in Figure 4. In addition, when inspecting the plots visually, the typical left-upward/right downward shift of the small and large SMD data points that we describe as typical for SMD versus SE funnel plots can be seen in Figure 4B. We do not see this pattern in the other panels. However, we agree that these may still appear asymmetric or even be slightly asymmetric, since for all unbiased scenario’s, ~50 out of 1000 simulations were asymmetrical by chance. We agree that our method to introduce publication bias can be refined and have therefore improved this analysis by introducing bias using a step wise function. Added R script to Supplementary file 1. Supplemental figure now shows example plots of the new step function. We agree that this would indeed be helpful to the reader, and have therefore added the original and adjusted effect sizes of the meta-analyses in Table 3 (see also reviewer 1, comment 3, second point). The Discussion section is missing a discussion of the limitations of the current study. The simulation had a limited number of conditions. Providing limitations identifies the scope of the presented findings. We have added the limitations of our data simulations to section 3.1 Limitations. Also, the authors should include a rationale explaining why they got these results Without that, the findings atheoretical; entirely empirical methodological findings are harder to accept with confidence. We have added Section 1.3 and a new (now Figure 2) in which we discuss the theoretical rationale of SMD vs. SE funnel plot distortion in more detail. We aim for the theoretical explanation to be suitable for the level of statistical knowledge of our target audience (review authors/ readers of reviews/ reviewers of reviews). In a meta-analysis using the SMD as effect measure, in the absence of publication bias, observed SMDs in a funnel plot will be scattered around the true underlying SMD. […] The effect of the second component on the SE, and the resulting distortion, is largest if the sample size is small and the SMD is large (Figure 2).”Added Figure 2, visualisation of the theoretical explanation. As described on in our tenth response to your major comments, we have added a description to Section 3.1 of the limitations of or simulation approach that closely resembles the sample sizes, effect sizes and number of studies of empirical data, but not varying degrees of heterogeneity, unequal variances between groups or sampling from non-normally distributed data. This we feel is beyond the scope of this study. In Table 4 legend the authors describe the magnitudes for the effect sizes included in the simulation. They should provide a reasoning for using an effect magnitude of SMD=1. By many standards, this would be considered a very large effect. This question was also raised by reviewer 1. We kindly refer you to our response to reviewer 1, major comment 2, first point, for an explanation and amendments to the manuscript. It is possible that the method would perform better (or worse) under conditions where the population magnitude is small or moderate. We interpreted ‘population magnitude’ as the effect size introduced. Although this method might indeed reach significance later, the methodological problem still exists. Slightly more power may be needed to detect it, but chances of false positive claims are still higher than they should be. We fully agree that heterogeneity in “real” meta-analyses may greatly influence the outcomes of Egger’s regression and trim and fill analyses. However, the goal of our current simulations is to illustrate the cause of the problem (why are SMD vs. SE funnel plots distorted), and how is this influenced by three straightforward variables: sample size, effect size and number of studies in the analysis. We feel that introducing heterogeneity into these simulations will not make the message more clear. Because heterogeneity is such a complex phenomenon, we felt it was more informative to perform re-analyses of empirical datasets, in which heterogeneity and the aforementioned variables are combined and which therefore optimally serve the purpose of showing how relevant our findings are in practice. © 2017, Zwetsloot et al.